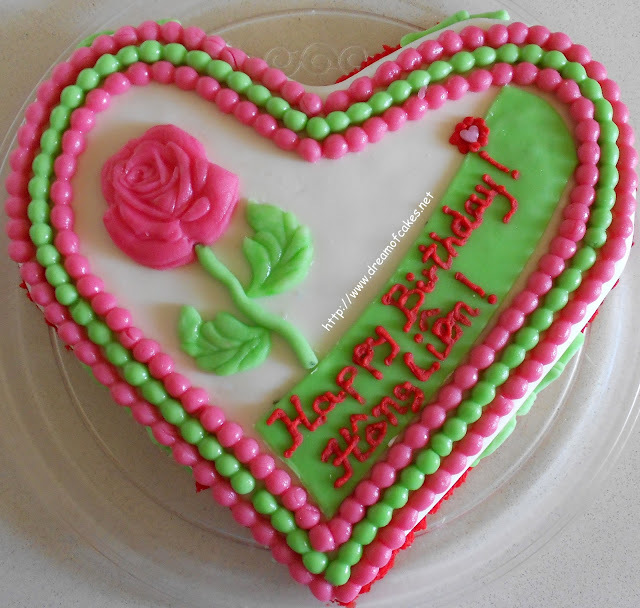 On Saturday, the 27th of August 2011, Lien Dong will celebrate her 23rd birthday. As I promised in an earlier post, this year I was going to choose a summer theme for her birthday. Well, this is one of the two birthday cakes, Lien is going to have this year. The other one is a Mermaid birthday cake. She helped me to make and decorate the 2nd cake, without knowing that this cake was for her too. She was asking me how old is the girl and she was saying that the girl will be thrilled when she will see it. She only found out that it was for her when I wrote her name on the cake. Actually, she was right, the girl was thrilled... :-)!!! Below you will be able to find the recipe for the cake. I am so sorry I forgot to take photos of the making process. I only took a photo from the cake just before I baked it. 1) Beat all ingredients in an electric mixer. Do not over mix. 2) Spray Wilton's Non Stick-Spray to a rectangular pan (15cm x 20cm); then pour mixture. 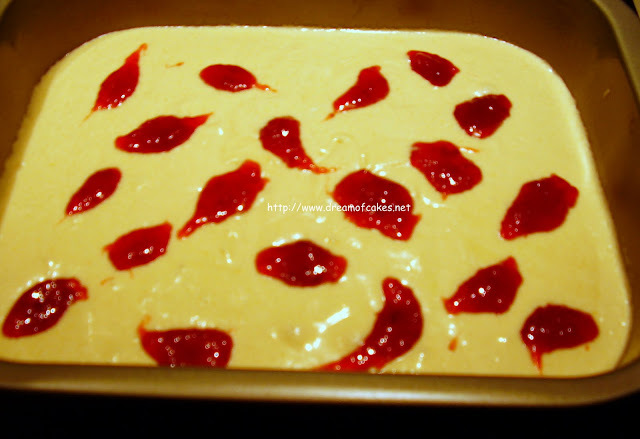 2) With the help of two teaspoons trop the strawberry jam on top of the batter just before baking. 3) Bake in a preheated oven, at 170ºC, for 35’ minutes. Then reduce oven temperature to 150ºC and continue baking for another 10’ minutes. 4) Allow to cool for 10’ minutes before you remove the cake from the pan to a wire rack to cool. I promise that I will give you more details about the Mermaid Birthday Cake in the near future. Lien Dong with her two birthday cakes. I dont know were you come up with the idea for all thes cakes. They are just fabulous! Thanks for sharing. Ssooo precious and just buzzed you! Wow! Those are adorable. 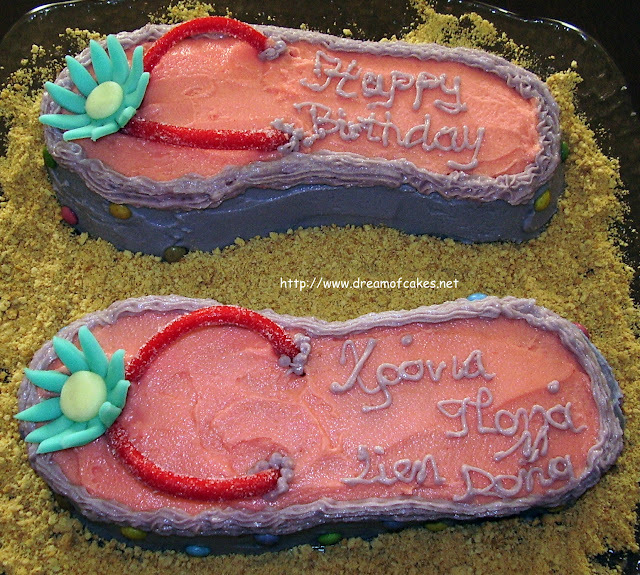 I will keep the flip flops in mind for my daughter's birthday. 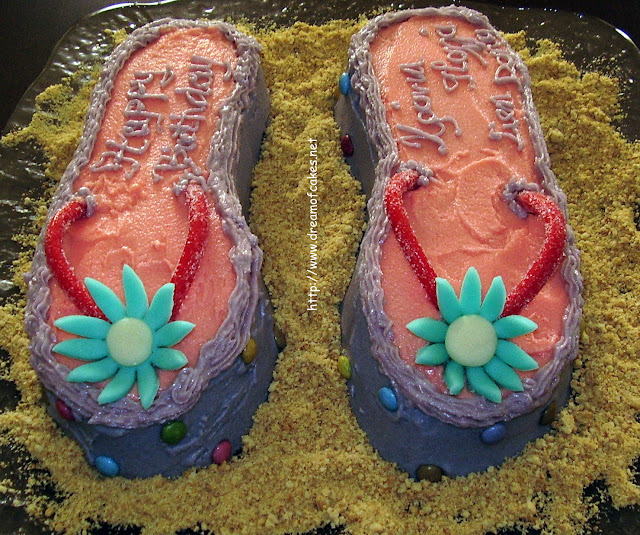 Those flip flop cakes are SO cute!! Great work!! And the vanilla and strawberry cake sounds delicious! Oh my God they are both gorgeous but I know I will just have to make the flip flops for my daughter. Beautiful, what a lucky girl, two birthday cakes. BUZZED you and bookmarked this site! Your cakes are wonderful! Great job! I will take a pair-have any in size 7 1/2? Amazing job on those cute flip flops-buzz! I will be looking forward to more on the mermaid cake. That is one amazing cake! Love how creative you are with cakes! Awesome cakes! I love that you used a brown sugar for sand...they are lovely! These look really nice! And I bet they taste great,too. I love strawberry anything! So pretty and a wonderful birthday gift! How on earth do you do it? Those are sooo cute!! Haha, never seen anything like it. Lucky birthday girl! While the cakes are adorable (so cute!) it's a vanilla strawberry cake with real strawberries? 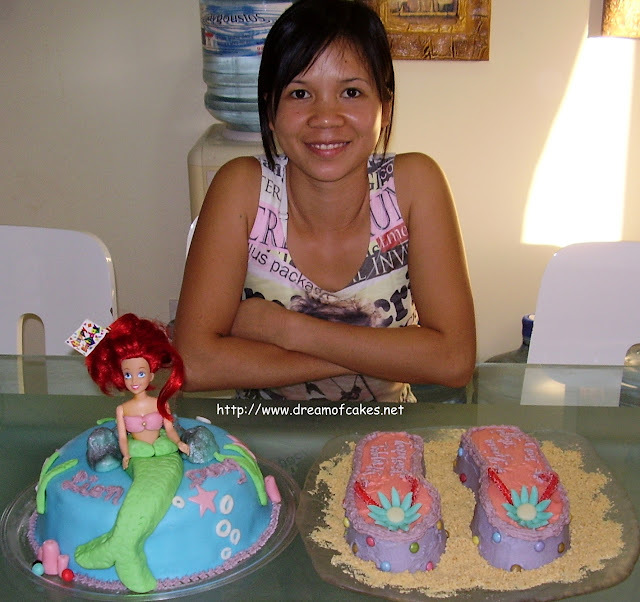 I love the Ariel cake! Great job. 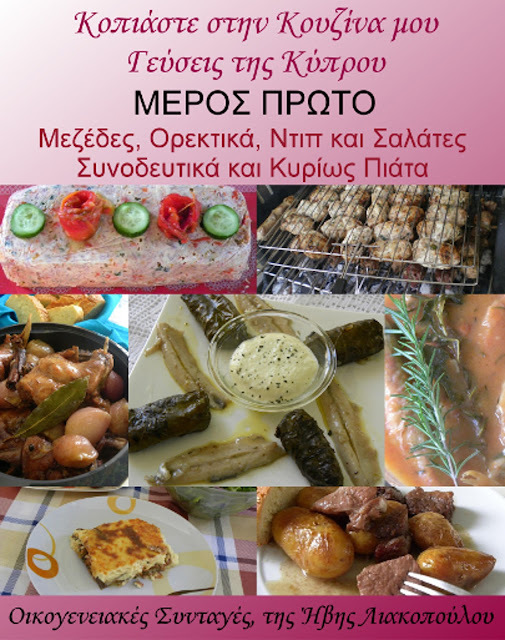 simple n easy recipe to prepare at home.in next month my son's birthday is coming,we will try this,thanks for sharing a nice recipe. What brilliant idea for a summer theme for your girl! She sure is blessed to have talented baker mum! The two cakes are just WOW!! What an awesome cake! And thank you for the recipe, I love strawberry and vanilla. This is SOOOOO cool! You are so freaking creative! What cute cakes! Very nice work. Una torta che ha il sapore del ... mare!!!!!! Adorable! Love what you did with these. Haha, don't know how you thought of this concept. Would like to see what you will think of in the future. 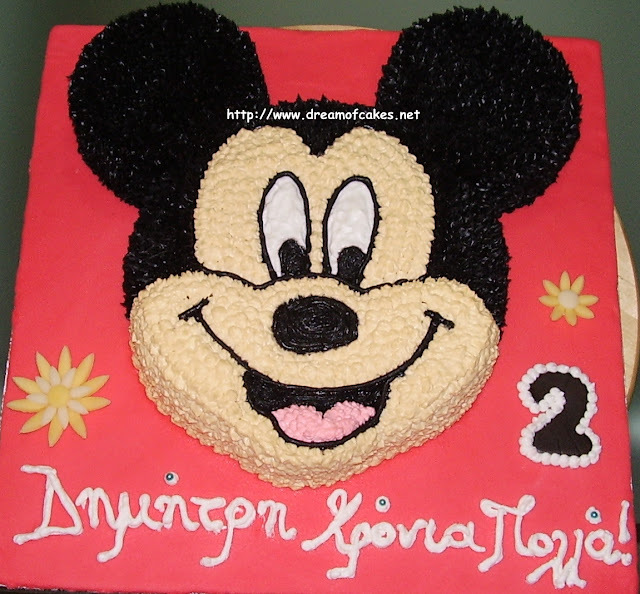 That's a very beautiful cake!! E!! These are simply gorgeous and adorable!! Superb talent lady. Oh my and Lien is just a beauty. What love you put into these cakes for her. Amazing! These cakes are absolutely adorable. I just love them. You are so talented! I hope the birthday was wonderful and I'm sure it was. Thanks for coming by, too. oh, this is too cute. I love it. These look great! I would love to have your kind of talent with cakes! Adorable cakes! I admire your talent. These are sooo cute!!! I love the flip flops!! You are very talented!